TSI PIV systems measure velocity by determining particle displacement over a precisely selected time using a double-pulsed laser technique. A laser light sheet illuminates a plane in the flow, and the positions of particles (naturally present or added to the flow to have sufficient number of tracers) in that plane are recorded using a digital camera. A short time (micro or milliseconds) later, a second pulse illuminates the same plane, creating a second set particle image. From these sets of images, PIV analysis algorithms obtain the particle displacements for the imaged region, to give the velocity information at thousands of locations-quickly, easily, reliably. Flow properties such as vorticity and strain rates are obtained for the entire region. Mean velocity, turbulence intensity, and higher order statistics are also obtained. MicroPIV systems measure the global flow fields in MEMS and microchannels, while High Frame Rate systems provide time resolved measurements with kHz update rates. TSI systems using patented Hart and Rohaly-Hart correlations and MicroPIV techniques give the most accurate results. 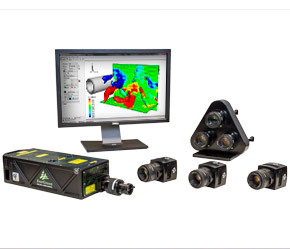 PIV/PLIF systems measure velocity and scalar properties. To learn more about PIV instrumentation and the many areas of research this system is involved in, attend TSI's Fluid Mechanics Webinar Series presented by our experts.